In the last installment of "The ST Gameshelf," I mentioned that, although there are hundreds of games available for your ST, a good many of them are rehashes of old themes. This isn't necessarily a criticism, though. Sometimes this rehashing adds a new and exciting feel to a worn-out theme. Most of the programs we're going to look at this time around fall under the "rehash" category. As far as game themes go, there really isn't anything new here; however, as with any artist, a clever program developer can take an old idea and make it into something special. A perfect example of an old theme renewed with exciting results is Blockbuster from Mindscape. If you're a fan of breakout-style games, then this is one program that is essential to your software library. Just the sound effects alone are worth the price! To add a little spice to the action, there are, randomly hidden inside the blocks, tokens that, once released, fall to the bottom of the screen. Each time you manage to grab a token with the paddle, the next higher weapon icon lights up. What weapon icons? Bouncing the ball isn't the only way you can knock out bricks; you also have at your command (if you've gathered enough tokens to "buy" the one you want) nine different weapons that may be used to give you a little advantage. 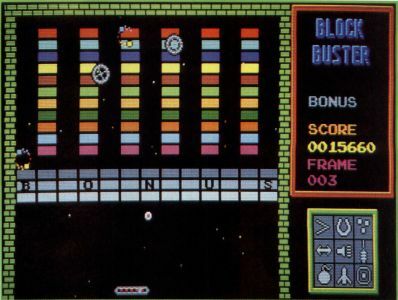 The "slowdown" weapon reduces the speed of the ball by 25 %; the "magnet" weapon allows you to catch the ball with the paddle, rather than just bounce it; the "divide" weapon places three balls on the screen simultaneously; the "wide" weapon elongates your paddle; the "torch" weapon lights up invisible bricks; the "laser" weapon adds laser firepower to your paddle; the "smart bomb" destroys all the aliens on the screen; the "missile" weapon adds another form of firepower to the paddle; and, finally, the "force field" weapon allows the ball to pass through bricks without bouncing, though it still destroys every one it touches. Whew! What an arsenal! Aliens? Yes, I did mention aliens, didn't I? The aliens are creatures that roam around the screen, deflecting the ball and generally being a nuisance. Each time the ball hits one, it's destroyed and adds 100 points to your score. And, as I said, the aliens also deflect the ball, so you have to be careful! The sound effects are the best I've ever heard on an ST arcade game. It's hard to describe them; that's how original they are. All the sounds are digitized, and you'll spend your first few games not trying to get a high score, but making sure you hear all the sounds. Blockbuster also comes with a program that allows you to create your own screens. You use the mouse to place the different colored bricks, as well as to set various game attributes, such as the number of tokens that will be hidden and the number of aliens that will be released. You may add these self-created screens to the master disk. Blockbuster is positively habit-forming. There are hours and hours of entertainment here for anyone who takes the plunge. A perfect example of an old theme renewed with exciting results is Blockbuster from Mindscape. If you're a fan of breakout-style games, then this is one program that is essential to your software library.